Steeped in religion, devotion and architecture, Chittoor is a place that everyone should visit at least once in their lifetime. Also blessed with scenic beauty, cascading waterfalls and a beautiful hill station, Chittoor is not a disappointment to the traveller who seeks redemption from the busy metro life. Also known as the Mango City, Chittoor offers myriad varities of heavenly mangoes to please its visitors. Chittor is a district laden with important temples, one of them being the Kanipakkam Vinayagar Temple. Apart from Tirupati, Tirumala and Srikalahasti, the Vinayagar Temple in Kanipakkam is another reason why pilgrims flock to the district of Chittor. Situated 56 km from Tirupati, the small town of Kanapakam is the abode of great deity Vinayaka. It makes for an ideal weekend getaway trip for city dwellers as well as a major pilgrimage site. This historic temple with Ganesha as its primary deity is also known as Shrine of Water and is in Irala Mandal of Chittoor district. The idol of Lord Ganesha in this temple is believed to be continually growing in size. The regal temple has immense religious significance and importance because of its miraculous idol. The water found in the complex is believed to be holy and can cure various deformities. Pilgrims visit this temple before going to Tirupati since it is a Vinayaka Temple. The Kanipakam temple is very well maintained by the authorities despite being a major crowd puller and is a rapidly developing complex. It acts as a magnet for devotees of Lord Ganesha during the rainy season when the main historical and legendary well fills up with water. This unique sanctuary of Ganesha is in the middle of a river. Its significance lies in its purity and rich heritage. Needless to say, this world renowned temple is a must visit on a trip to Chittoor. 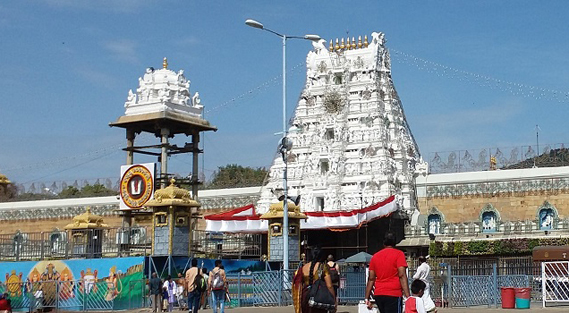 Located on the seventh peak, Venkatachala, of the Tirupati hill, this temple houses the most breathtaking idol of Lord Venkateshwara, and it is said that a look at the idol is sure to leave one spellbound. Ancient Hindu texts mention that worshipping Lord Venkateshwara is the only way to salvation. Soaked in sanctity, religion, history and culture, a visit to this temple is a memorable one. One can offer different darshanams to the deity. Srikalahasti Temple is located in the bustling town of Srikalahasti which is famous for being the Srikalahasti Mandal Headquarter in Tirupati Revenue Division. It lies in the Chittoor district in the south-eastern state of Andhra Pradesh, India. Srikalahasti is often referred to as the holy city of south-east India as it is famous for the Srikalahasti Temple which is devoted to Lord Shiva and is of immense religious importance for Hindus. Devotees of Lord Shiva from all over the world visit the temple to offer their prayers and seek blessings. Srikalahasti, thus, is a well-known tourist destination in India. The elaborate structure of the temple complex is a breathtaking view right from the entrance and has intricate carvings of numerous mythological illustrations that one can explore in the divine surroundings. The beautiful Srikalahasti Temple was built during the ancient Pallava period. It is believed that people who are troubled by various Doshas can get their Shanti done in this temple and get relieved of these doshas. The temple represents one of the five elements (Pancha Bhoota), the Air or Vayu. The place has an abundance of vibrant, divine aura and has the potential to draw visitors with its ornate shrines and mesmerising beauty. Srikalahasti is an excellent example of south Indian architecture where highly ornamented gopurams with expansive intricately carved interiors unfold the magnificent treasures of the Dravidian style of architecture. Believers think of this temple as the one with immense divine powerful to wash off all sins of the past and present lives. Considered to be one of the world's largest pilgrim destinations, Tirumala celebrates its grand festival, the Srivari Brahmotsavam, with much pomp and show. Queues during the annual nine-day Brahmotsavam festival can stretch for kilometres. The festival was commenced by Brahma himself in which the main Venkateshwara temple is decked with adornments. If you wish to go to Tirumala for darshan, the most agreeable time would be during the festive season of Brahmotsavam. During the festival, processional deity of Lord Venkateswara, along with his consorts Sridevi and Bhudevi, is taken on different Vahanams on the streets surrounding the temple. Brahmotsavam is a holy cleansing ceremony in honour of Lord Brahma, and the one at Tirumala is by far the largest which attracts pilgrims and tourists from all parts of India and across the world. Located about 10 km from Tirupati and on the Eastern Ghats, Venkateshwara National Park and biosphere reserve is a quintessence of Mother Nature's generosity. Home to endemic plant species and interesting fauna species like Slender Loris, Tree shrew, Wild dog etc., this place is a haven for Nature and animal lovers. Bird watchers are also in for treats like Crested Serpant Eagle, Indian Roller, Kingfishers etc. But the main attraction of this national park are the three waterfalls, viz, Talakona, Gundalakona and Gujana. Talakona is the highest waterfall in Andhra Pradesh and needless to say, it is a stunning spectacle. With good Forest guest houses and accommodation facilities available, one can spend an entire day here. Mogili is a coastal village in Bangarupalem Mandal, which is at a distance of 25 km from Chittoor. This place is famous for the Mogileeswara temple, which is 10 km from Palamaner towards Chittoor on NH4 route. This temple is popularly known as Dakshina Kailasam and has sculpture work. The presiding deity in this temple is of Lord Shiva that was founded by Mogilliappa and placed under Mogili tree. The village is visited by tourists to explore the rural style of architecture. Inhabited by people of Jayanthi group, speaking Telugu language, tourists can also witness the rural side of the place. Sri Lakshmi Narayana Swamy Temple in Vepanjeri Village is situated around 15 km from Chittoor. The presiding deities in the temple are Lakshmi, Lord Srimannarayana, Sri Lakshmi Narayana and his consort, Sri Lakshmi Ammavaru. The first mention of the temple was in the 12th century between 1178 and 1218. During this period, Kulottunga III of the Chola dynasty was ruling this region. The temple was pushed to its nadir when the French forces ruled the region between 14th and 15th century. It is in 1986 that the temple was reconstructed by the Komandur family in the Pallava style of architecture. Tourists visit this temple in large number during the celebrations of annual festival, Brahmotsavams. Nagari is a semi-agrarian and semi-industrialised city, situated on the bank of river Kusasthali. This place is popular for Nagari hills and has many well established textile industries and numerous temples. Tourists visit this place for picnic, expedition and mountaineering activities that has gradually become popular traveller's destination. One of the highest cliffs present here is popularly known as Nagari Nose, which has 855 metres elevation. It has been named so because it is quite similar to a human nose. Sri Desamma Vari is the famous temple in vicinity; visited by tourists with the belief that eye problem can be cured by pouring the abhishekam water inside the sanctorum. Guntipalle is a village located at 18 km from Chittoor. It is situated on Chitoor-Penumuru road, which is at the distance of 4 km from Penumuru town. This village is visited by tourists to spot the famous tourist attraction, the rock pillar. Known as Puligunda, literally meaning Tiger Hill, which is located at a height of 213.36 m. Travellers can easily commute to this place by local transport or buses available at frequent intervals. Kalavagunta is situated in the north-east direction of Chittoor at a distance of 8 km. It is a small town located on the merging point of the rivers Aragonda and Ponnai. The temples present in this town have beautiful architecture and constructed by the rulers of Chola dynasty. This place is famous for two temples, Mukkantisvara Temple dedicated to Lord Shiva and Lakshminarayana, devoted to Lord Vishnu and goddesses Lakshmi. The rich cultural heritage and ancient structure attract tourist to visit the small village of Kalavagunta. Kaundinya Wildlife Sanctuary is situated at Palamaner, around 60 km from Chittoor. The sanctuary is surrounded by valleys and hills and is spread in an area of 358 sq. km. This place is a home for large number of elephants, which has migrated from nearby forest areas. The sanctuary has rich collection of flora and fauna of tropical thorn comprising bamboo, ficus bengalensis and albizia amara. Along with elephants, various other animals like hares, jackals and more can also be seen in this sanctuary. Gurramkonda is a hill fort town between Bangalore highway and Cuddapah in Chittoor district. The average elevation of this historical place is 2,125 ft. The major highlight of this town is the Gurramkonda Fort. It is a beautiful architectural structure existing in the town and is about 500 years old. This town once had forty mosques, which are all destroyed and extinct now. It is said that the rulers travelled on the horses to reach atop hill to their palaces. Thus, the name given to the place was Gurramkonda, in which Gurram means horse and konda means hill. Golden Temple Vellore presents a captivating scenic beauty along with architectural excellence. Located in 100 acres of landscapes, it is at the centre of star-shaped path. The temple has been constructed keeping dimensions of energy in mind. For instance, the physical dimensions of Golden temple are made in such a way that it accumulates large energy by absorbing it from the nature itself. The path to the temple has been created in the shape of a star, which denotes the divine Sri Chakra, which is believed to generate a flow of energy comprising 12 positive verticals. This symbolises the path of purity and spirituality. Ancient Hindu scriptures say that wherever there is a hill, Lord Murugan resides as the all-powerful Deity. Of these Tirupparamkundram, Tiruchendur, Tiruvavinankudi, Tiruveragam and Palamuthircholai are famous shrines, collectively called 'Kundruthoradal'. The holy shrine at Rathinagiri also features in this category. The best time to visit the arch is between 6 A.M. and 8 A.M., fog permitting. There is a well maintained garden in front of the arch should visitors wish to rest or wait until fog clears. Sunset is also a good time to visit, as the arch looks even more striking and mystifying in the light of the setting sun. Seen in the light of a full moon the arch is said to be “ethereally beautiful". Tada falls or Ubbalamdugu Falls is in Varadaiah Palem mandal of Chittoor district in India. It is situated on the border of Tamil Nadu and Andhra Pradesh. It is situated around 95 km from Chennai. Jalagamparai waterfalls is one of the important tourist spots in Yelagiri Hills to visit. At a distance 37 km from Yelagiri, 37 from Athanavur and 13 km from Thirupattur, magnificent Jalagamparai Waterfalls near Jadayanur is created by the River Attaaru running through the valleys of Yelagiri Hills. It is one of the best places to visit in Yelagiri Hills. Jalagamparai waterfalls is flowing down from a height of 15 meters, the place is popular among lovebirds. Bathing in this waterfall cures diseases because it passes through various herbal plants in the hills. The waterfall is situated in an isolated place and is not crowded most of the time. The best time to visit the Jalagamparai waterfalls is from November to January as the water from the North East Monsoon rains will ensure that there is water in the waterfalls. This waterfall is very near to the Jalagamparai Temple which is an important temple dedicated to Lord Shiva. mong all temples and Teerthams, Pasupu Teertham is one of them which is famous. Generally, it is a water body located in Tirumala, situated very close to the Sri Venkateswara Temple and can be reached by walk. Theertham is blessed with fine and pure-blue water fall which is said to one of the sacred water bodies of India. This water body also very close to celestial water sources in heaven, which has a special association with Lord Venkateswara. Pasupu Teertham also seizes some notable stories about its spirituality. Its holiness and spirituality allures millions of pilgrimages who frequents with a firm faith that their sins plus evildoings would be washed off with an effortless dip in this holy teertham.